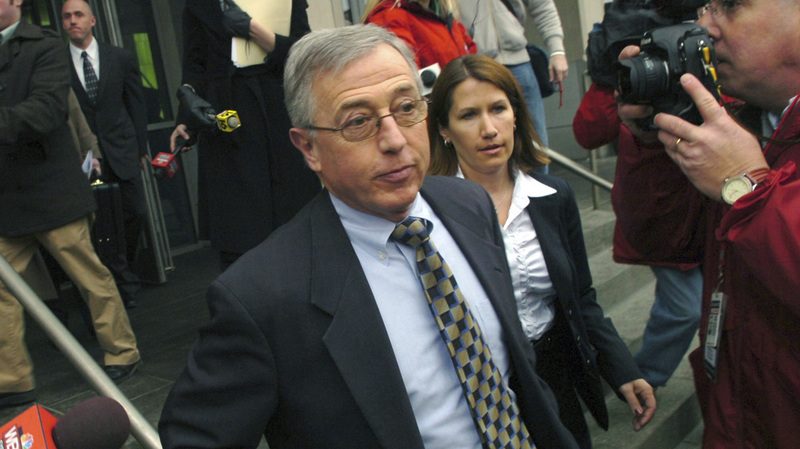 Judge Sentenced To 28 Years In Bribery Scandal : The Two-Way Mark Ciavarella Jr. was convicted of taking bribes from developers of juvenile detention centers. The case, known as "kids for cash" led to the tossing of 4,000 convictions issued by Ciavarella. Editor's note, March 10, 2019: In recent days, this 2011 story has been circulating on social media with an altered Facebook headline that was not created by NPR. The headline and story published here are accurate as originally published in 2011. A Pennsylvania judge was sentenced to 28 years in prison in connection to a bribery scandal that roiled the state's juvenile justice system. Former Luzerne County Judge Mark Ciavarella Jr. was convicted of taking $1 million in bribes from developers of juvenile detention centers. The judge then presided over cases that would send juveniles to those same centers. The case came to be known as "kids-for-cash." "The media attention to this matter has exceeded coverage given to many and almost all capital murders, and despite protestation, he will forever be unjustly branded as the 'Kids for Cash' judge," their sentencing memo said. The Times Leader, of Wilkes-Barre, Pa., reports that the court house in Scranton was overflowing this morning. More than a dozen people who said they had been affected by the judge's decision stood outside, awaiting the sentencing. "These kids are still affected by it. It's like post traumatic stress disorder," Pollins told the Times Leader. "Our life is ruined. It's never going to be the same... I'd like to see that happen to him," he said.